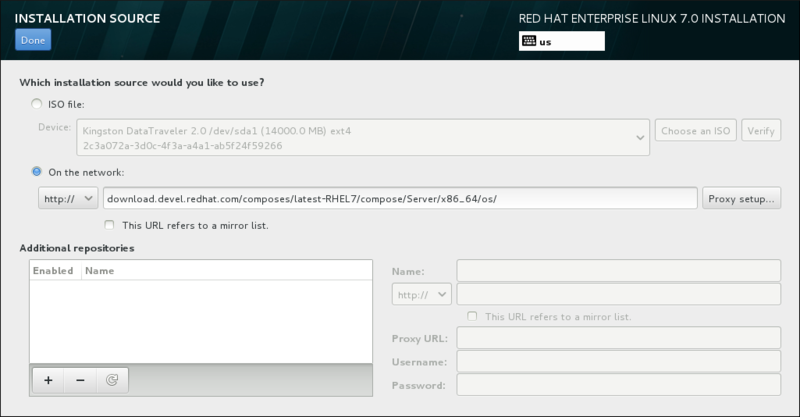 To specify a file or a location to install Red Hat Enterprise Linux from, select Installation Source from the Installation Summary screen. On this screen, you can choose between locally available installation media such an ISO file, or a network location. If your HTTP or HTTP URL refers to a repository mirror list, mark the check box under the input field. You can also specify additional repositories to gain access to more installation environments and software add-ons. See Section 17.14, “Software Selection” for more information.